Bier spots (also called physiologic anaemic macules, angiospastic macules and exaggerated physiologic mottling of the skin) are transient, small, hypopigmented asymptomatic macules,1-4 mm in diameter, with an irregular border, interspersed with blanching, erythematous macules. 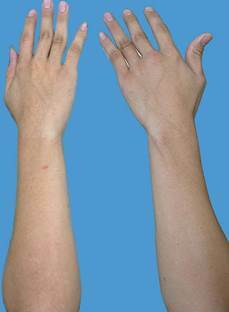 They are usually seen on the extensor surfaces of the arms and legs of young adults, otherwise healthy individuals. 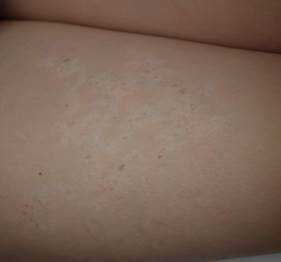 The lesions gave a reticulated, mottled appearance. Bier spots were originally described in 1898 and have also been called. The lesions were associated with dependency of the limbs and almost disappeared completely with elevation of the limbs. 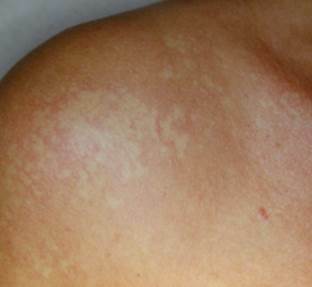 The intervening skin may seem erythematous but blanches with pressure so that the hypopigmented macules disappear. 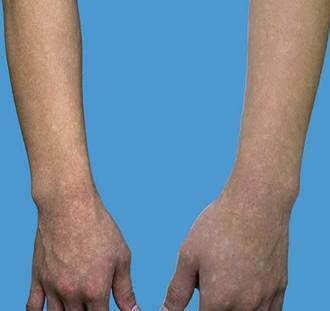 When the arms are raised above the head for several seconds and normal venous return is restored, the spots disappear. Bier spots are a benign vascular anomaly thought to be caused by vasoconstriction in small vessels. Hence, there is venodilation in the erythematous areas and venoconstriction in the pale areas. The areas of pale skin are thought to be due to raised pressure constricting small veins (venous hypertension), relative to normal-appearing surrounding skin. Awareness of this condition is important because the phenomenon can resemble pigment changes. Since physiologic anemic macules are asymptomatic and transient, patients should be reassured that no treatment is needed. Although asymptomatic, these spots bothered the patient cosmetically. Bier spots should be differentiated from nevus anemicus and achromic nevus. Nevus anemicus is a congenital, asymptomatic, hypopigmented macule or patch appearing at birth. It grows with the child. It is secondary to reduced blood flow because of a localized, deficient function of α-adrenergic receptors in the muscular walls of the blood vessels, and increased reactivity of α-adrenergic receptors increased sensitivity to circulating catecholamines (adrenaline e noradrenaline) that lead to blood vessel constriction. Nevus anemicus is present at birth, but it may not be visible until a few months of age. It is usually a single, asymptomatic pale patch (does not become reddened on rubbing) with surrounding smaller pale macules. It is most typically found on the trunk but can occur at any body site. The lesions are permanent. Achromic naevus (also called nevus depigmentosus) is a well-defined pale patch (it is not completely white) usually noted at birth or early childhood. It is usually solitary, several centimetres in diameter, with an irregular but well-defined border. Achromic naevus most commonly arises on the trunk, but may also arise on the limbs and elsewhere. Shape and size varies, but remain stable over time. 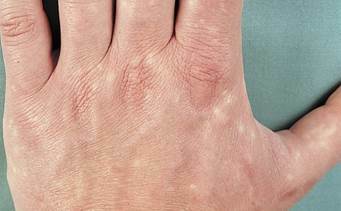 Often, smaller hypopigmented macules arise around the edges, resembling a splash of paint. The cause ccould be or a reduced numbers of melanocytes or a reduced melanin production or an inability of melanocytes to transfer melanosomes (melanin-containing granules) to keratinocytes (skin cells). 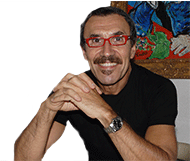 Links consigliati: Do you know your moles?, | Hypomelanosis progressive macular | Stucco keratosis | Actinic keratoses | Frank’s sign.